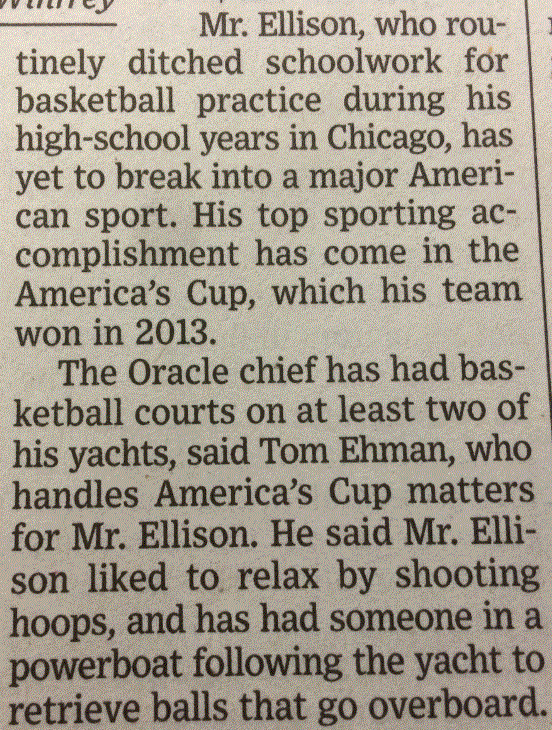 Larry Ellison, billionaire CEO, makes unsound business decisions with regards to his basketball playing on his yacht. Larry Ellison, co-founder and CEO of Oracle, has gobs and gobs of money. How much money? Well enough that he can do this. Boy that seems wasteful, doesn’t it. I mean, when I’m playing basketball on my yacht and I lose a ball into the ocean I just purchase an extra basketball. Wouldn’t it make more sense for Ellison to just buy a bunch of basketballs and grab a new one every time he loses one overboard? So my question is this: How many basketballs would Ellison have to lose in order to make the expense of basketball retrieval worthwhile? Here is some of the board work we generated during the initial Problem Defining and Know/Need-to-Know process. It’s critical that we understand our ultimate goal here: we want practice developing a mathematical model based on a given scenario. A model should, among other things, simplify a complex situation. 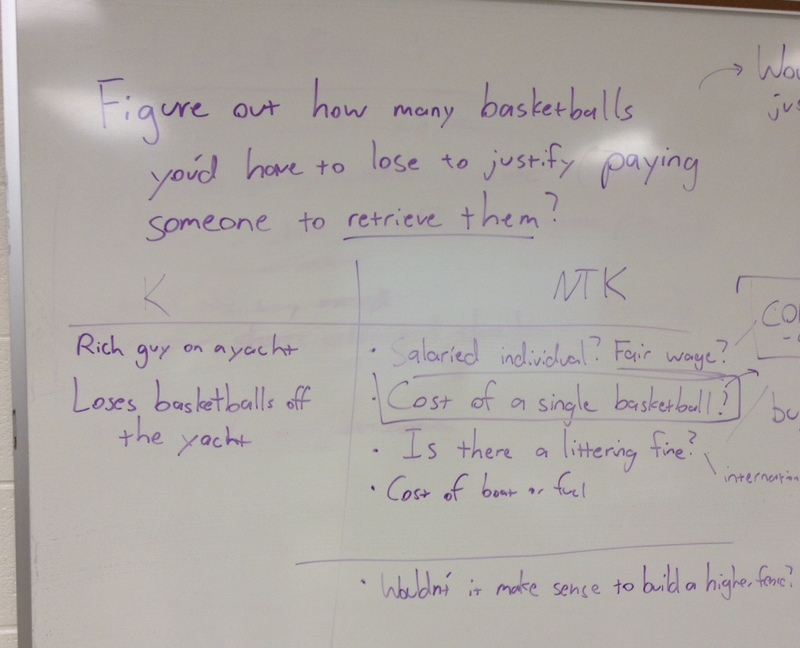 We wound up focusing on only two variables: the cost of the annual salary and the cost of a basketball. A couple variables that folks tossed out ended up not being explored mathematically. As you may have experienced, when given a modeling scenario, students might throw out potential variables to tack on in perpetuity. There comes a tipping point where the mathematical model ceases to simplify a complex scenario and only confuses it further. I find this pretty typical of “make a budget” tasks or other accounting-type tasks (“what about sunscreen costs? what about health insurance? what about the yacht food? etc etc etc.”). When you’re facilitating the brainstorming process, I’d suggest you restrict the number of variables you’re including to two or three. This way, the entire class is focusing on the same few variables, keeping the focus on the model development, not the number of ingredients you can toss into the stew. Here’s the initial PDF file if that embedded version looks goofy. This is an awesome way of breaking down a problem into a simpler parts. You really focused on the critical thinking of the modeling which is what students usually need the most work with. I am sure this was a fun opportunity for the students. I think it is interesting to share all the things that students were thinking. For example, I also wondered about the cost of the fine (I saw that on the board) or environmental impact. Thanks for sharing! Yeah I think it’d be fine to include additional variables so long as they are clearly labeled and defined, such that the variables don’t stunt the discussions and comparisons of the models. This is a great way to connect “real” world to math. I work in inner city schools and they often hear about these extravagant lifestyles or see them on television. I try to tell my students that math is everywhere, so this article would be a good way to show them just exactly that. There is also an opportunity to bring in cross-curricular content like social studies and media. I’d hope the absurdity of a guy on a yacht paying someone to retrieve his basketballs stands for itself. This is “real-world” to Larry and Larry only, I’m guessing. Remember: it’s all about modeling. Great job breaking this down. I think that, given billionaire mind sets, Elllison was probably trying to “do his part” to avoid adding to the Great Pacific Garbage Patch. Egad. Ha, I think you’re right Elizabeth. More of an “environmental” decision than an economic one.